Summary. In the article the main features of households sector as one of the main components that forms the country's economy, the supplier of economic resources and the main consumer of goods and services are considered. It is substantiated that the use of SNA in the research of the households sector provides the basis for creation of an analytical and institutional base for their development. The conceptual bases of forming of organizational-economic mechanism of households sector development for the purpose of providing economy transition to a new type of growth are defined. Key words: household, households sector, organizational-economic mechanism of households sector development, GDP, SNA, economic growth, economic development. Statement of the problem. The transformation of economic system has changed the conditions of functioning of all subjects of the national economy. Structural shifts in the households sector have expanded the sphere of their activity, intensified functions, created new requirements regarding economic behavior, also it changed socio-economic conditions of functioning. Now, in addition to effectuation the functions of consumption, saving, investing, reproduction of the population, the households sector is the owner and supplier of economic resources. Owning of production factors households are independent producers of goods and services. In the new conditions, the households sector has a rather significant share in the economy as an independent source and factor of economic growth. The study of its influence on the qualitative structure of GDP makes possibility to determine the level of country development and the prospects of economy transition to a new type of growth. Analysis of recent researches and publications. Writings of many domestic and foreign researchers are devoted to the study of households and their role in the socio-economic system of society. In particular, scientists study the regularities of development households at different historical stages [1; 5; 10], their functions as an important component of society , approaches to evaluation of incomes and expenditures of households , structure and functions of the household at the microeconomic level , etc. However, the role of households sector in GDP forming and the development of the organizational-economic mechanism of development of Ukrainian households sector in the context of its impact on the country's economic development remain insufficiently explored. The objective of the article is determination of the role of the households sector in GDP forming and the conceptual basics of creation of an organizational-economic mechanism of its development for economy transition into a new type of growth. The main material. The results of the analysis of the use of term "household" in foreign and domestic scientific publications [3, p. 16; 8; 9, p. 128; 12, p. 871; 13] allow to treat this term as a socio-economic association, which includes both one person and a voluntary association of several persons who are or are not in family relationships for support of the socio-economic status, expansion their individual opportunities, satisfaction of material and immaterial needs [2, p. 6]. In Ukraine, since 1999, a selective survey of living conditions of households is implemented. This survey is carried out on a permanent basis and according to international standards . Their results allow to determine the level of welfare of households, factors of its forming and the degree of involvement in social and economic processes. Since 2007 new criteria are the basis for the study of households' differentiation, in particular, the indicators of monetary and aggregate income instead of the indicators of monetary and aggregate expenditures that were applied in 1999-2006. The change of criteria is due to the fact that, an exceeding of households incomes over their aggregate expenditures is experienced since 2004 in the same regions, and in 2006 – almost all regions. Therefore, income indicators have become more accurate to characterize the real welfare state of households than cost indicators. In accordance to the current international practice since 2011, when calculating the costs and resources per capita and the indicators of differentiation of population and households by the level of material welfare, the State Statistics Service of Ukraine uses an equivalence scale that reflects the reduction of the minimum necessary needs per member of the household with an increase of the household size and change its structure. Economic science considers the household as one of the most important components that forms the economy of any country, as households are both suppliers of economic resources and the main consumers of goods and services. The aggregate consumption of country households is a major lever of their impact on the economic system, creating a market for goods and services of enterprises that have the possibility of development and increase of the country's GDP. Therefore, research of households is important for understanding the development of processes at the macroeconomic level. Study of the households role in the national economy is carried out in special statistical studies, which are the basis of national and international comparisons. The system of national accounts allows to research households at the macroeconomic level. The System of National Accounts (SNA) is the internationally agreed standard set of recommendations on how to compile measures of economic activity in accordance with strict accounting conventions based on economic principles. The recommendations are expressed in terms of a set of concepts, definitions, classifications and accounting rules that comprise the internationally agreed standard for measuring such items as GDP, the most frequently quoted indicator of economic performance [13, p. 1]. The households sector can be considered depending on which parameters are of primary interest. This includes, in particular: types of households production, types of income, consumption structure, etc. In SNA the conceptual and practical reasons of identification problems of subsectors households sector are analyzed, households as producers and consumers, their wealth and appropriate income streams are consistently considered. The preparation of national accounts of Ukraine is based on the methodological principles of the international standards of SNA . In national accounts, economic activity is seen as a system of consistent and interconnected accounts that characterize operations of production, generation, distribution and use of income, capital accumulation and the acquisition of financial instruments. Institutional units-residents are grouped into sectors, which include the households sector, along with sectors of non-financial corporations, financial corporations, general government and non-profit institutions serving households. Analysis of main indicators of the households relative to GDP forming and the characteristic of its contribution to other macroeconomic parameters shows the significance of the households sector for the functioning of national economy (Table 1). In particular, in 2011-2016, was 12-15% of the total economy output, gross value added – 19-23%, net value added – 21-24%, intermediate consumption – 8-10%. Also during this period, the share of gross income in the households sector was 64-80% in the economy, and the final consumer spending was about 80%. By the events of 2013, the gross household savings also had a high proportion (60-95%), but in 2014-2016, it dropped to 5%. The share of gross profit and mixed income and net profit remained fairly significant in 2016. Thus, research of the functioning problems and performance of households is important for developing mechanisms for regulating its development. Therefore, the use of SNA in such research provides the basis for the forming of an appropriate analytical and institutional base for the development of households sector and the forming of an organizational-economic mechanism of this development. The organizational-economic mechanism of development of the households sector should be considered in the system of relations between households and other institutional units of economy that provide the appropriate conditions of functioning and development. Unfortunately, the results of the analysis of different studies of development of the households sector and its accounting into social production indicate that approaches to regulation of its development in countries with a socially oriented market economy are somewhat eclectic . When forming the organizational-economic mechanism of the development of the households sector, it is necessary to take into account that the household plays a significant role in economy functioning, providing: the necessary consumer demand, activization of investment activity, development of human capital, etc. It should be remembered that the regulation of the development of households acquires the character of multisubjective impact, integrating elements of state regulation, self-regulation, regulation by market infrastructure institutions, public organizations, etc. On this basis, it is possible to develop theoretical-methodological and methodical approaches to the consideration of the households sector as a holistic object of regulatory impact to create an organizational-economic mechanism for its development, based on an appropriate institutional basis (system of complementary instruments and levers). At the same time, the world economy is at the start of the transition to rational use of natural and technical resources, the maximum possible energy saving, repair instead of utilization and purchase of new, lease instead of ownership, recycling of waste and obtaining new types of raw materials, energy [11, c. 39]. That is, the linear approach to economic development is inferior to the circular economy. Exactly the household can become a powerful driver of the emergence of a circular economy in the future, due to the potential for self-sustainability and development. Conclusion. Household as a primary economic unit in the conditions of reforming the Ukrainian economy plays a significant role in all social and economic processes that take place in society. This role will continue to grow, as the modern household is the basis of the country's economic prosperity. However, a household as a participant in the economic system can perform their functions only if the appropriate institutional environment and the coordinated activity of its subjects and constituents are developed. To do this, it is necessary to develop an organizational-economic mechanism of the development of the households sector, effectiveness of which will depend on the optimal combination of various instruments and regulatory methods, their systemic use on the basis of achieving of the priorities of the transition of the economy to a new type of growth and development. Hladun, O.M. (2005), "Households: functions and research issues", Demography and social economy, no. 2, pp. 88–96. Honcharova, S.Yu., Buriak, I.V. (2016), "Scientific and methodological approaches to the definition of a household, its role and functions in the economy", Visnyk Odeskoho Natsionalnoho Universytetu, Vol. 21, no. 4, pp. 135–139. Zherebyn, V.M. Uroven zhyzny naselenyia [Population's standard of living], YuNITI-DANA, Moscow, Russia. Zhuk, M.O., Zdrok, V.V. (2014), "Structure and functions of the household at the microeconomic level", Herald of Khmelnytskyi national university, no. 6, pp. 228–234. Zukhba, O.M. (2013), "Household in different types of economic order: the evolution of theoretical models", Ekonomichnyi visnyk Donbasu, no. 3, pp. 48–53. 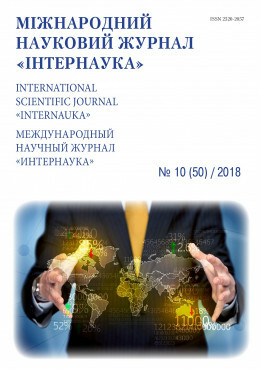 Melnyk, A., Tsishchyk, N. (2008), "Household sector in the modern economic system: theoretical and empirical aspects", Visnyk Ternopilskoho natsionalnoho ekonomichnoho universytetu, no. 3, pp. 7–21. Mylashko, O.H. (2008), "Statistical estimation of income and expenditure of households according to the system of national accounts", Visnyk sotsialno-ekonomichnykh doslidzhen, no. 30, pp. 247–253. The official site of the State Statistics Service of Ukraine, available at: http://ukrstat.gov.ua/ (Accessed 12 April 2018). Rayzberg, B.A., Lozovskiy, L.Sh. and Starodubtseva, E.B. (2007) Sovremennyiy ekonomicheskiy slovar, 5th ed. [Modern Economic Dictionary], INFRA-M, Moscow, Russia. Chunikhina, T.S. (2010), "Regularities household development: theoretical aspect", Visnyk Khmelnytskoho natsionalnoho universytetu. Ekonomichni nauky, no. 2, Vol. 3, pp. 54–58. Derii Z. (2017), "Households role in the circular economy", Problemy i perspektyvy ekonomiky ta upravlinnia, no.3, pp. 39–45. McConnell, C.R., Brue, S.L., Flynn, S.M. (2009) "Economics: principles, problems, and policies", 18th ed., McGraw-Hill/Irwin, New York, NY. System of National Accounts, 2008 (2009), available at: https://unstats.un.org/unsd/nationalaccount/docs/sna2008.pdf (Accessed 12 April 2018).